News @ Valor | Valor Specialty Products | Make the ULTIMATE First Impression in Your Neighbourhood! 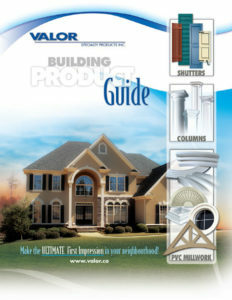 A comprehensive product guide, showcasing the vast possibilities available through Valor Specialty Products. Valor produces many standard designs popular with developers and builders. We offer one of the broadest ranges of PVC Millwork, allowing us to provide the best product solution. Decorative elements - whether trim, accents, moulding, louvers or full-sized gable pediments - are some of the highest-impact architectural details you can add to a home. Properly selected, they become the aesthetic focal point of design and impact the style and curb appeal of a property. Valor Specialty Products Inc. offers fiberglass columns to match your needs. Combined with numerous cap and base options, fiberglass columns can meet your exact project requirements. They are a perfect touch to any project, be it residential or commercial. The load-bearing strength of fiberglass columns makes them as practical as they are beautiful. Since they are crafted with such style and grace, their functionality tends to fade in light of the sophistication and class they lend to any home or structure! We are pleased to launch the new corporate site. Here you will be able to find out all the product information and technical details you are looking for!